Former Arkansas Gov. Mike Huckabee is not wasting any time tending to a political network in Texas as he sets out on his second bid for the White House. As he embarks on his second bid for the White House, former Arkansas Gov. Mike Huckabee is wasting no time tending to a political network in Texas — the state where his first campaign came to a close seven years ago. Huckabee, who made his 2016 bid official Tuesday, has scheduled a 17-city fundraising tour that starts Monday in Houston and goes on to include three other stops in Texas. He hits Austin later Monday, Dallas on Tuesday and Amarillo on May 28, according to a memo released Wednesday by his campaign. The fundraising blitz highlights Huckabee's ties to a state never too far — both literally and figuratively — from his political career. A former pastor, Huckabee spent a year studying at Southwestern Baptist Theological Seminary in Fort Worth. He went on to lead a church in Texarkana, the city that straddles the Texas-Arkansas border. While there, he was elected president of the Arkansas Baptist State Convention, a post that set him on track for the Arkansas governorship and, ultimately, an insurgent 2008 bid for the White House. It was in Irving on March 4, 2008, that Huckabee took the stage and broke the news to supporters that he was bowing out of that year's presidential race. Calling his campaign the "journey of a lifetime," he threw his support behind John McCain after losing four states — including Texas — to the Arizona senator that day. Andrea McWilliams, the Austin lobbyist who served as a Texas co-chair of Huckabee's 2008 campaign, said this time he benefits from higher name recognition than ever thanks to how he has spent the last several years: hosting a Fox News show that put him in front of a top-rated audience every weekend. Another advantage, she said, is Huckabee's record of taking on political allies of former President Bill Clinton in Arkansas. “You’ve got to have someone who has proven to beat the Clinton machine if Hillary is going to be the nominee," McWilliams said in an interview Sunday. "There's no other candidate that has has that level of interaction — and victory – against the Clinton apparatus, and that really sets him apart." McWilliams and her husband, Dean, are hosting the Austin fundraiser for Huckabee, according to the memo from senior Huckabee adviser Chip Saltsman. Dallas oilman Bobby Adkins Jr. is hosting the Tuesday reception, while RV dealer Jack Sisemore is putting on the Amarillo event. The former Arkansas governor also has friends in the Legislature, where Reps. Jim Keffer, R-Eastland, is already pledging to do all he can to help put Huckabee in the White House. "I'm all in," said Keffer, who also backed Huckabee in 2008. "I think there's a lot of choices, but at the end of the day, I think he's going to be the choice." Lt. Gov. Dan Patrick was one of the Huckabee's most prominent supporters in Texas in 2008, when Patrick was a state senator. Huckabee later returned the favor, endorsing Patrick for lieutenant governor and campaigning with him in Texas. The two share an adviser: veteran strategist Bob Wickers, who helped guide Patrick to victory in the lieutenant governor's race last year and is now on board for Huckabee's 2016 run. A spokesman for the lieutenant governor would not say Thursday whether Patrick plans to back Huckabee again. Patrick "remains focused on the 84th legislative session at this time," said Alejandro Garcia, the spokesman. Rep. Phil King, another Texas co-chair of Huckabee's 2008 campaign, is also holding off any kind of endorsement for now. The Weatherford Republican said Friday he is not making any decisions about the 2016 contest until he finishes his term as national chair of the American Legislative Exchange Council. He has that position through the end of this year. Huckabee has not ignored Texas while crisscrossing the country laying the groundwork for a 2016 campaign. Over four days in February, he made eight stops in the state for a tour promoting his latest book, God, Guns, Grits, and Gravy. 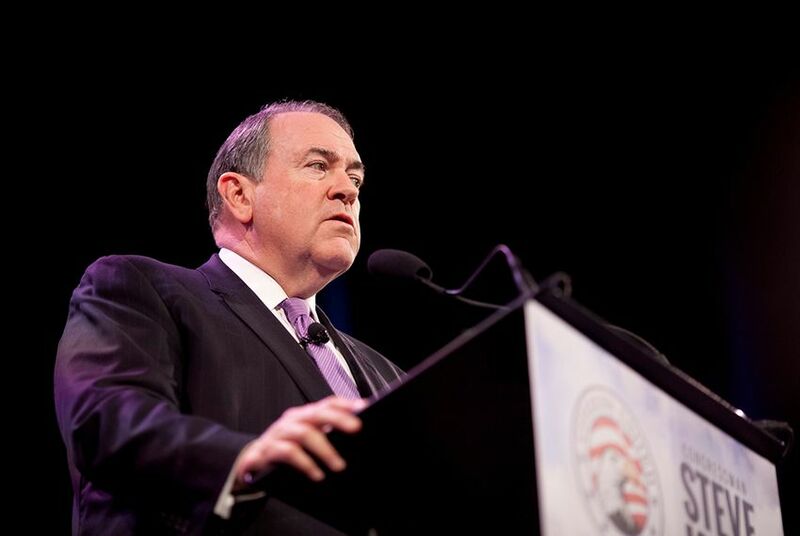 Last week, Huckabee was the keynote speaker at a meeting of the National Hispanic Christian Leadership Conference in Houston, where he sounded the alarm about religious liberty being "under assault." His remarks before hundreds of Hispanic evangelicals came a day after the U.S. Supreme Court heard oral arguments on gay marriage. "May I say to you that I respect the courts, but the Supreme Court is only that — the supreme of the courts," Huckabee said to growing applause. "It is not the supreme being. It cannot overrule God." Even in his stump speech, Huckabee has not neglected the Lone Star State. He frequently makes reference to the contested decision last year by Houston officials to subpoena the sermons of five pastors who opposed the city's equal-rights ordinance. At the height of the controversy, Huckabee traveled to Houston to speak at a rally in support of the pastors. "It is one of the most outrageous overreaches of government that I'm familiar with," Huckabee told reporters before the event, which attracted thousands. "For a long time, I have thought people sitting in the pews thought politics didn't touch them. Well, now they're beginning to understand it didn't just touch them, it punched them right in the gut."